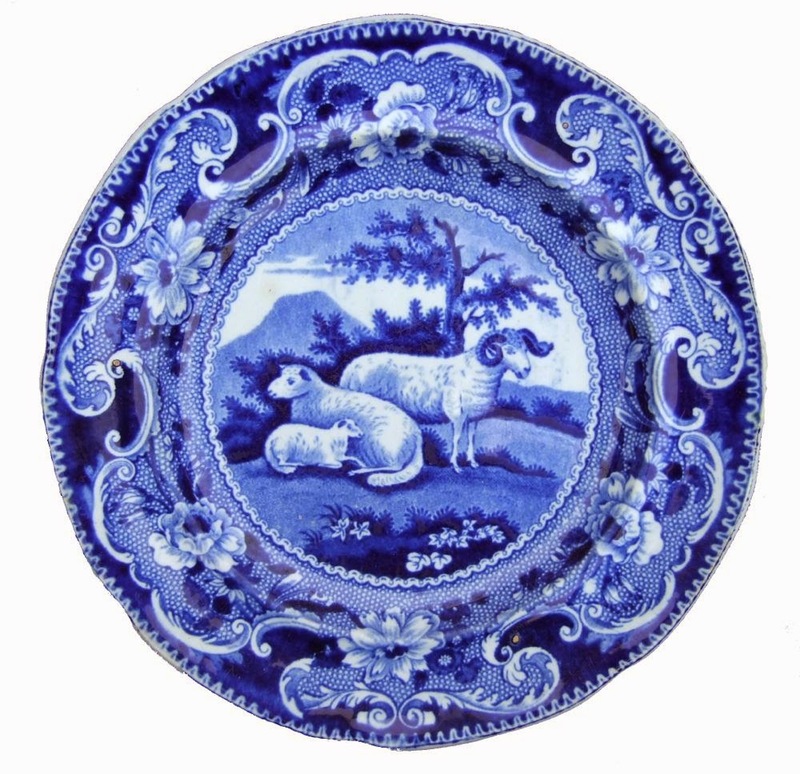 Source print for the above pattern is from "The Cabinet of Quadrupeds" by John Church, 1805. 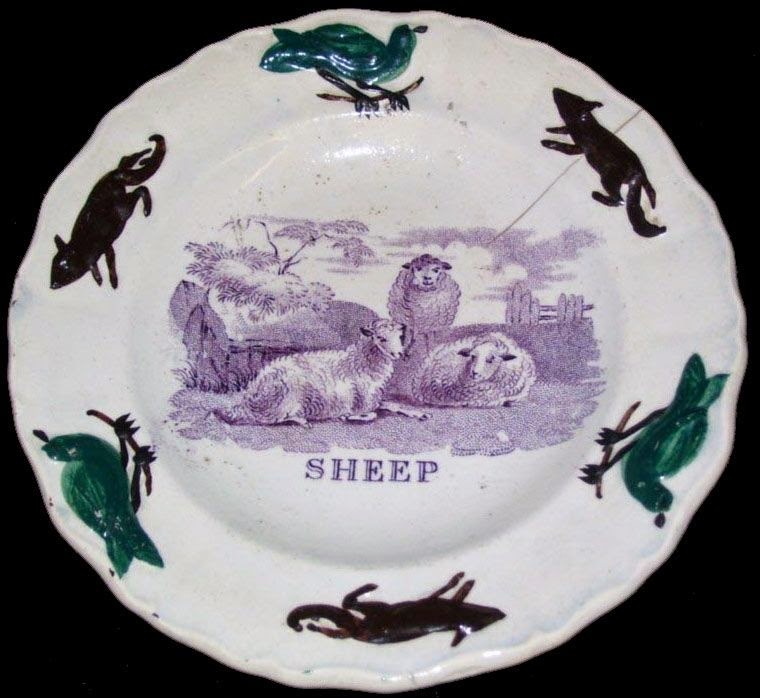 Notice that the plate has the ram standing behind the sheep. 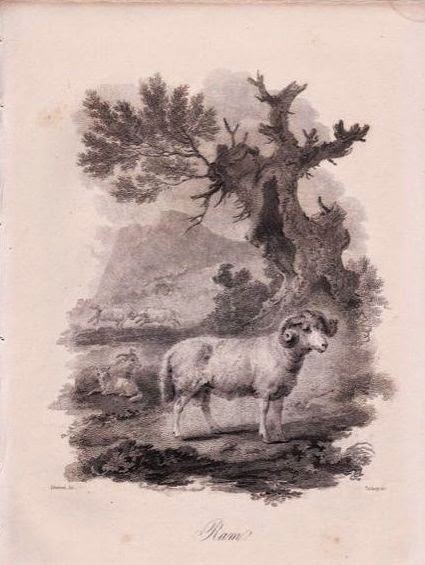 The two sheep are to the left of the ram in the source print. And, the female has horns! 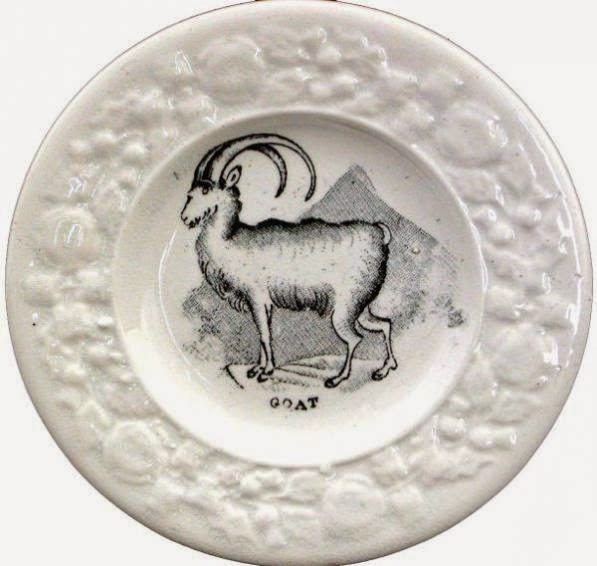 Perhaps this animal is a goat? The celebration of the Chinese Lunar year is five thousand years old. 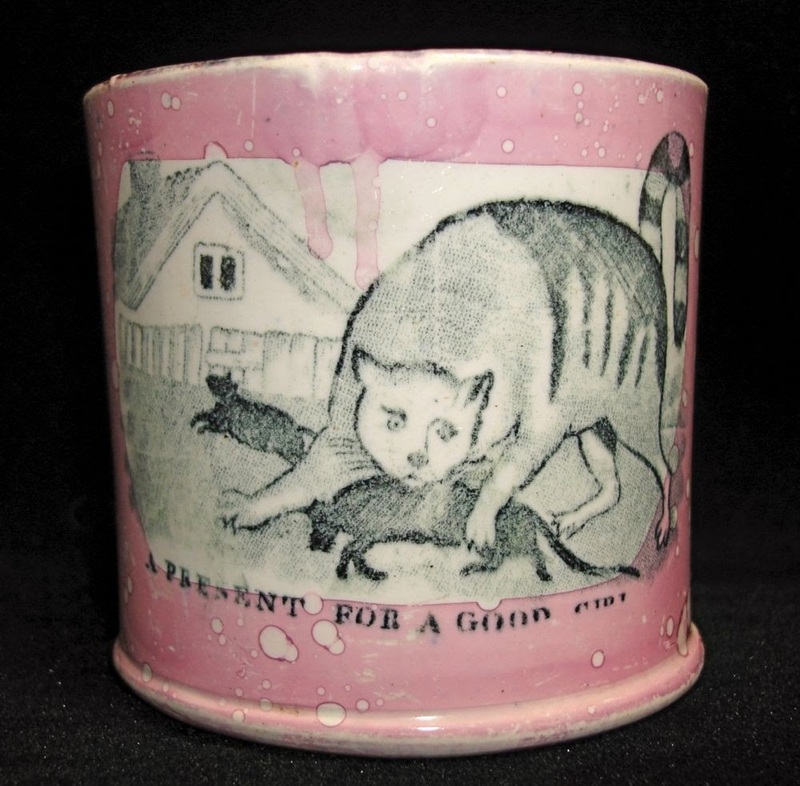 There are twelve animals in the Chinese calendar; a different one for each year of a twelve year cycle. The beginning of the Chinese New Year always falls between January 21 and February 21. This year it begins on February 19. 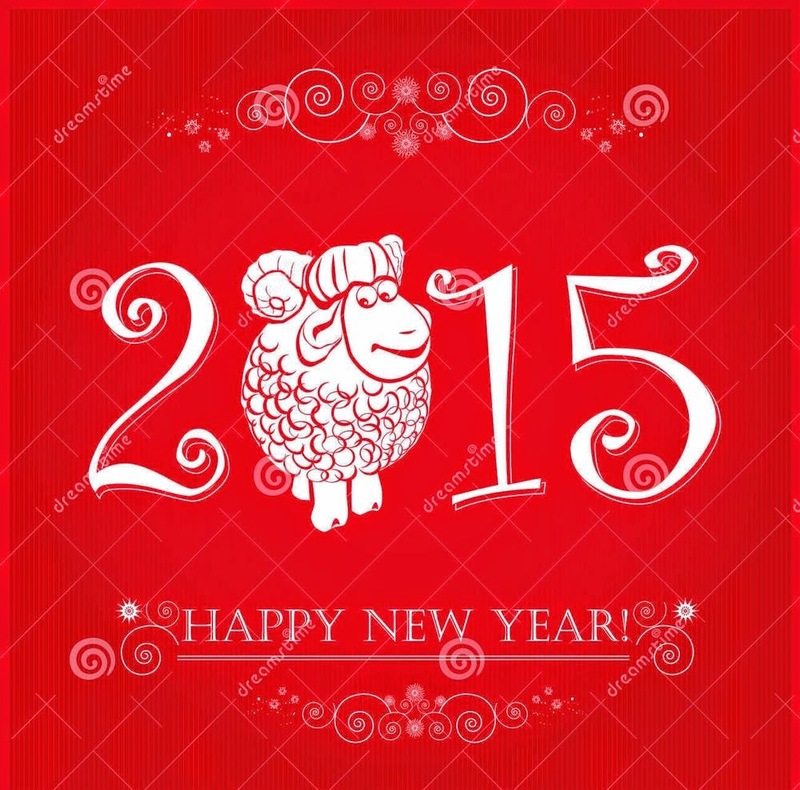 It is the Year Of The Sheep or Goat or Ram. I was a bit confused but I read good explanations on Mystery Fanfare and CNN. It turns out that the Chinese use one character for horned animals (you'll see there is way more to it than that). 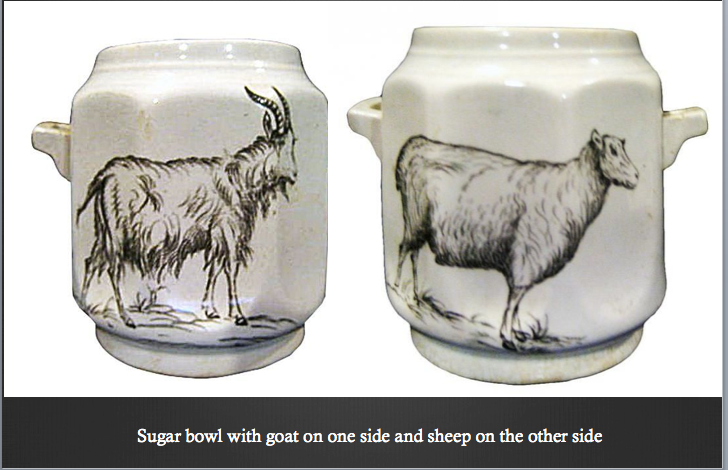 Below is a child's sugar bowl with a sheep on one side and a goat on the other. Here are two more of my favorite sheep and goat patterns. 恭賀發財 Gung Hay Fat Choy! 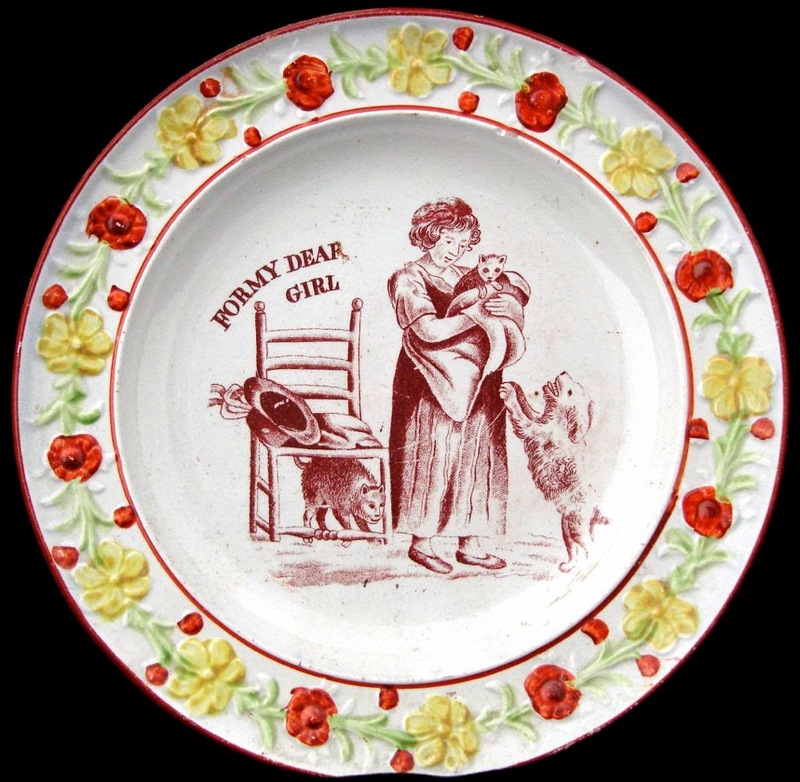 Children's china was often intended as a reward for good behavior, doing well in school or behaving in church. It was also a gift of love. 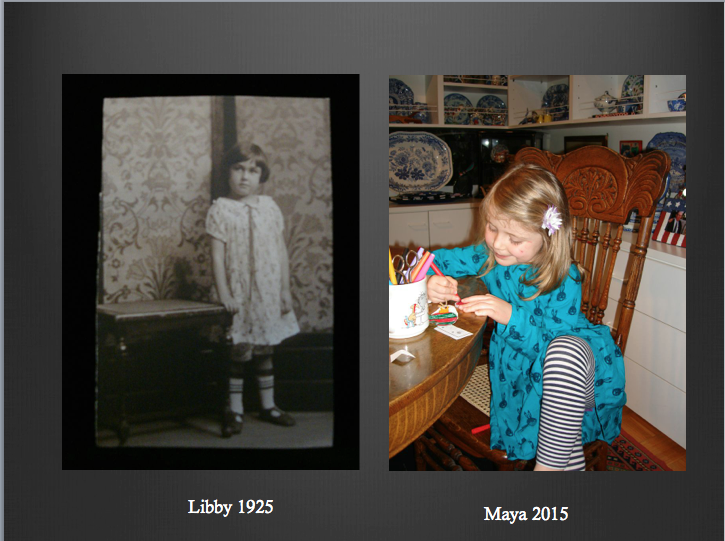 My granddaughter is five today. She has been a gift from the moment she was born. 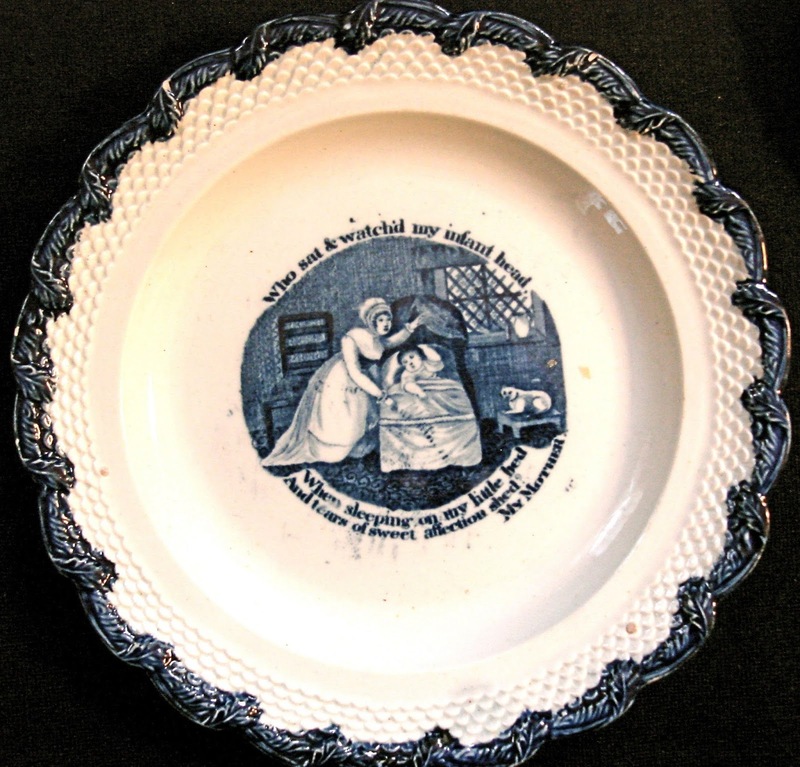 Here are some transferware patterns intended for dear (or good) girls. T.G. 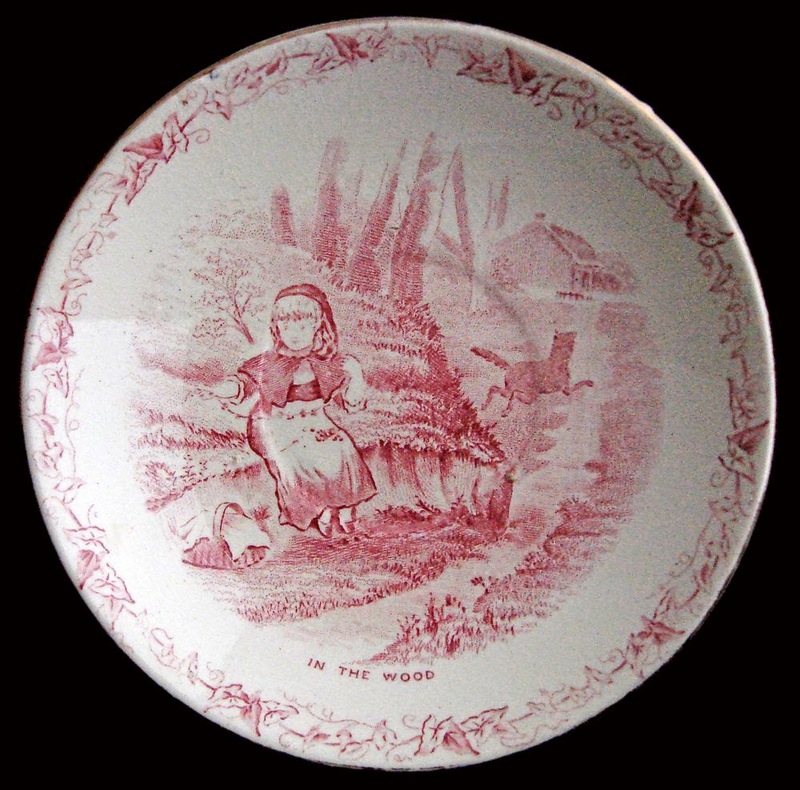 Green & Co. (1864-1987) "In The Wood" 4.12 inch saucer, ca. 1889/Notice the wolf running off to granny's house while Little Red picks flowers for her. "Little Red Riding Hood" is one of my favorite fairy tales. (I have written about it before in my post Little Red Riding Hood In French). When I was a little girl, I learned so much from the story. Listen to my mother! Be careful in the woods because I might meet a wolf. Wolves with good manners can be dangerous because manners can mask bad intentions. Trust your first impressions because wolves can disguise themselves as grannies! 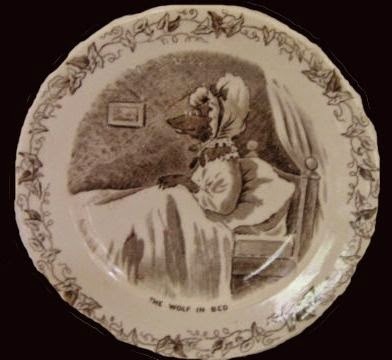 T. G. Green & Co. "The Wolf In Bed" plate. 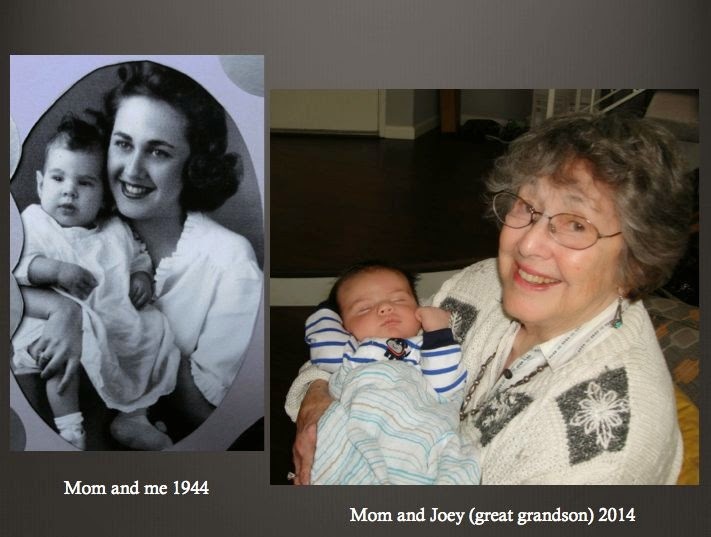 This is not granny! 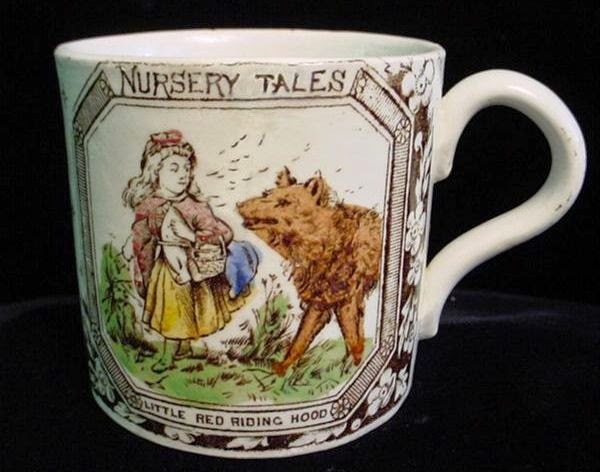 There are so many Red Riding Hood transferware patterns that I can only assume the story was powerful for others. 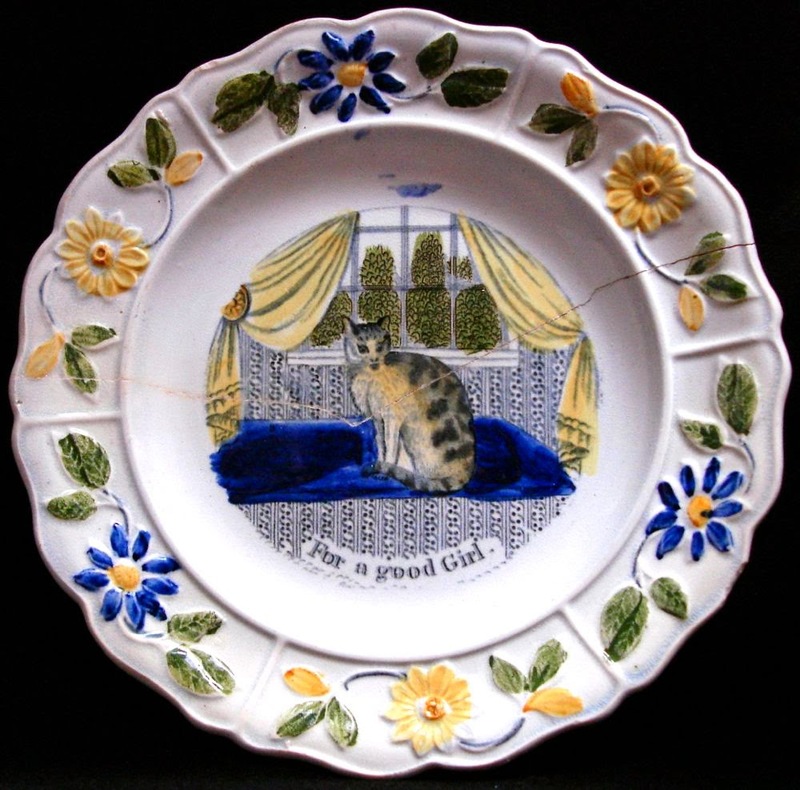 Many appear on items intended for children like the saucer and small plate above, which are from a child's tea service by T.G. 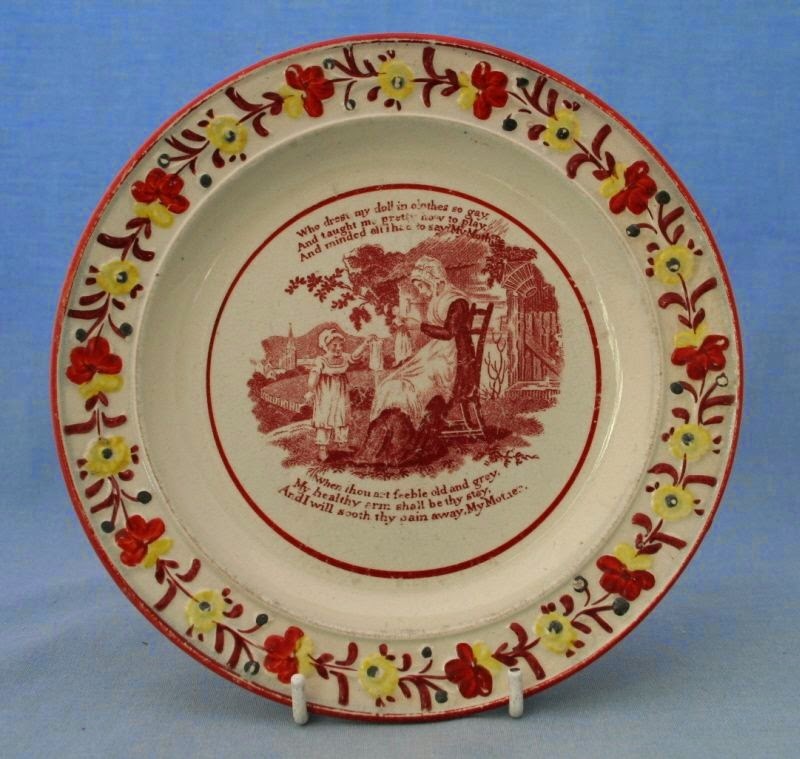 Green & Co. Or, the plates below by Brownhills Pottery that depict four scenes from the story; Red Riding Hood Starting, Red Riding Hood Meets the Wolf, Red Riding Hood At Her Grandmothers (sic) Cottage, and Red Riding Hood And Her Supposed Grandmother. I like the use of the word "supposed." There is even the occasional pattern on a plate on mug. 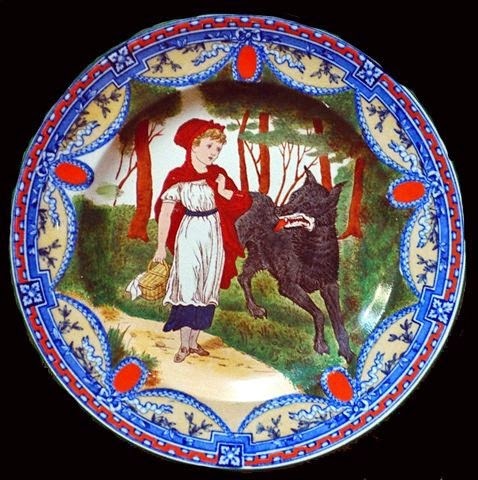 "Red Riding Hood Meets The Wolf" 7.12 inch plate. 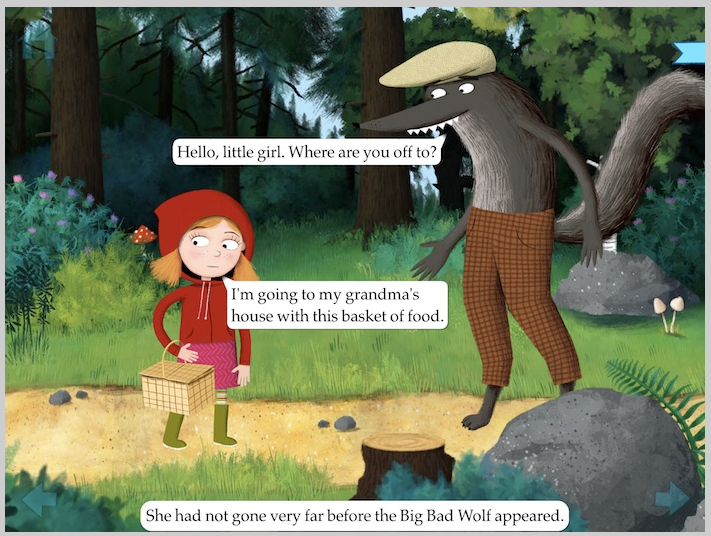 Red Riding Hood illustrates the letter "R." Quite an unusual choice. 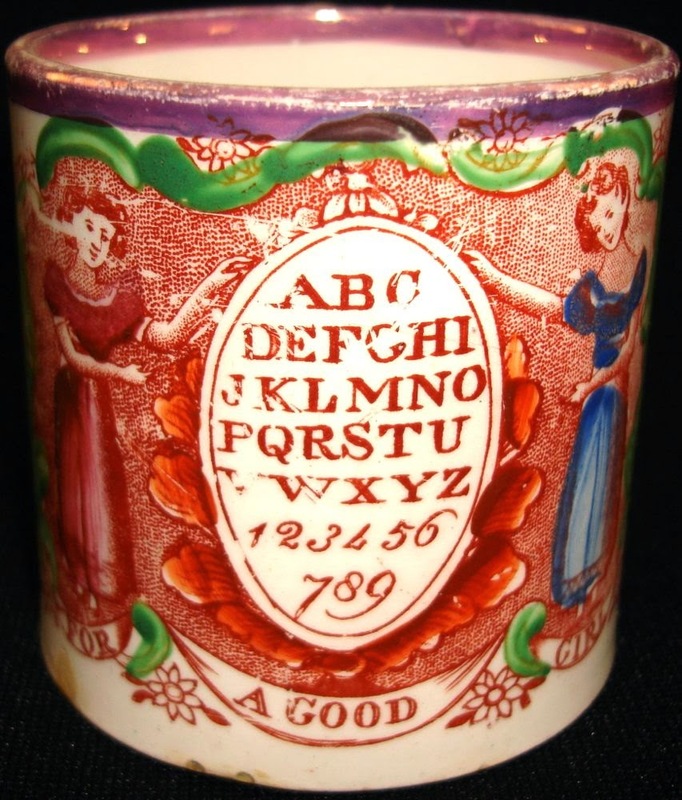 The letter "R" is usually represented by a rabbit or a rose. 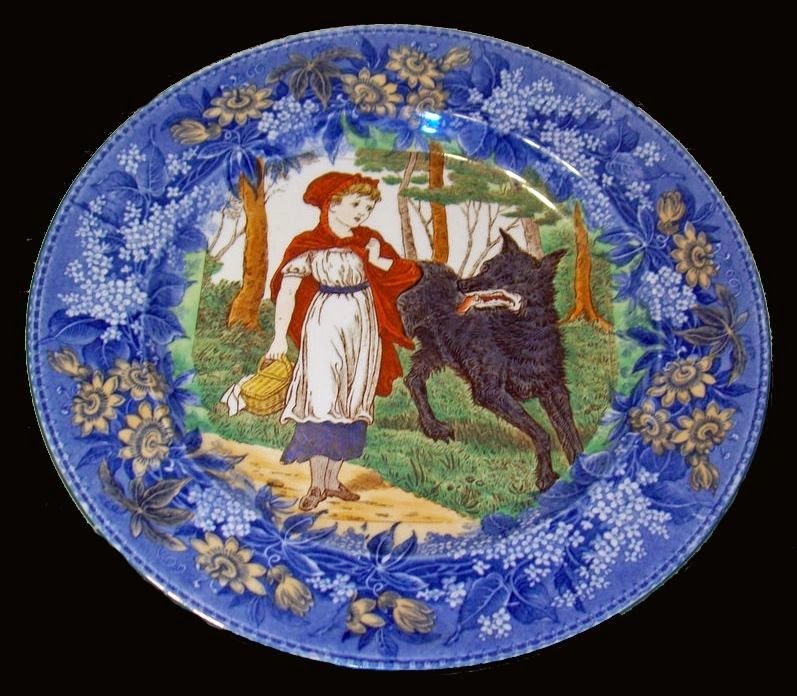 Tiles and plates with scenes from the story were made by Wedgwood at the end of the 19th century. 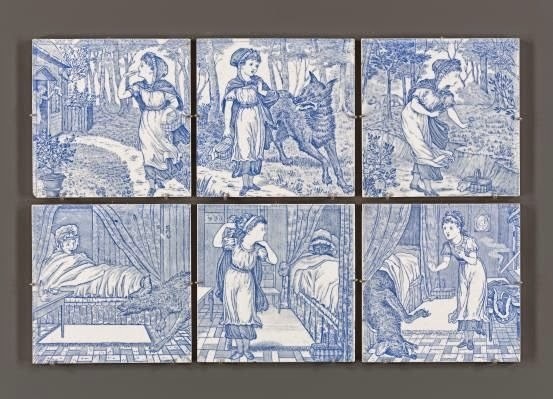 Below are tiles from the series of six; Red Riding Hood waves to her mother, she meets the wolf, picks flowers for granny, the wolf meets granny, the wolf is in granny's bed, the wolf is dead (I don't remember the woodcutter killing the wolf in granny's bed, but the telling of a fairy tale is as varied as the teller). 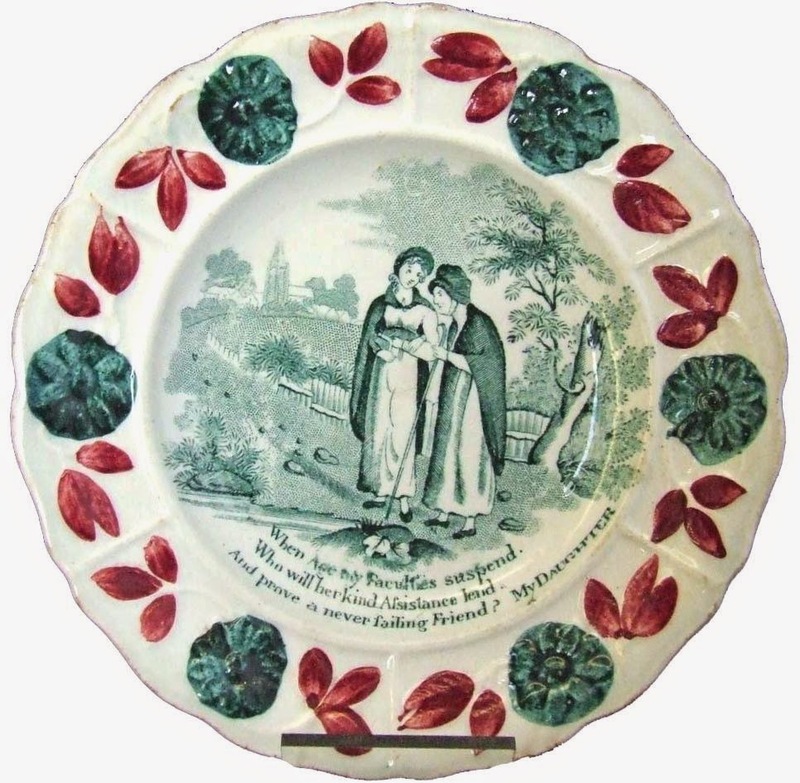 Wedgwood Red Riding Hood tiles/There is no text but the story is easy to follow. Perhaps the tiles were intended to be used around the fireplace in the nursery. What fun it would be to have children tell the story while looking at the tiles. 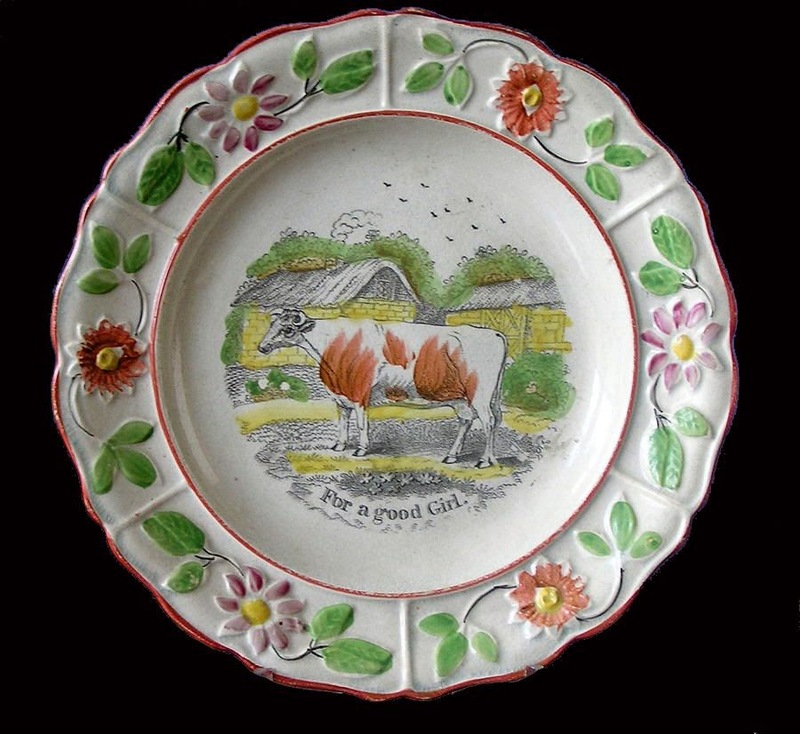 The patterns proved popular, so the tiles were adapted to plates with the addition of borders. Many different borders were used. 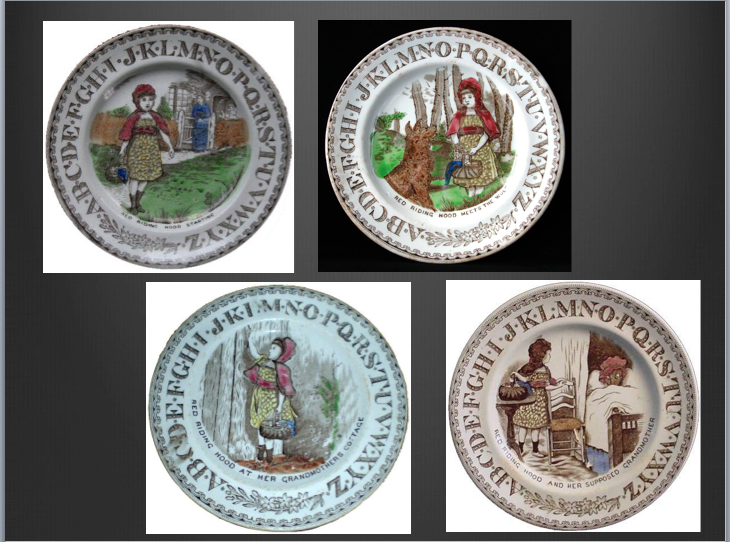 Notice that both plates are the same scene as the tile in the top middle. 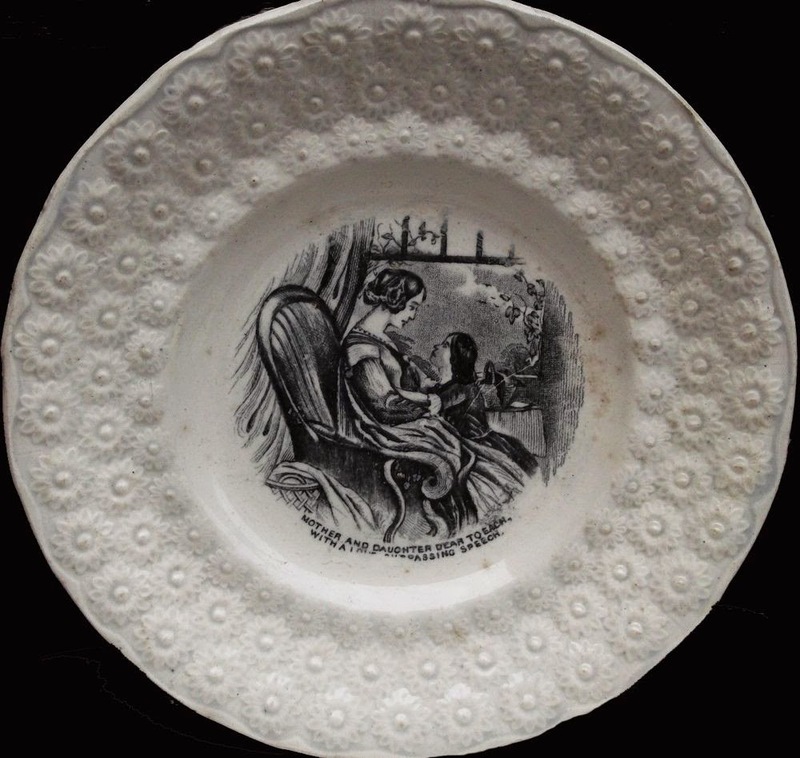 Josiah Wedgwood (1759-2005) 10 inch plate, ca. 1885/There would have been a set of six. 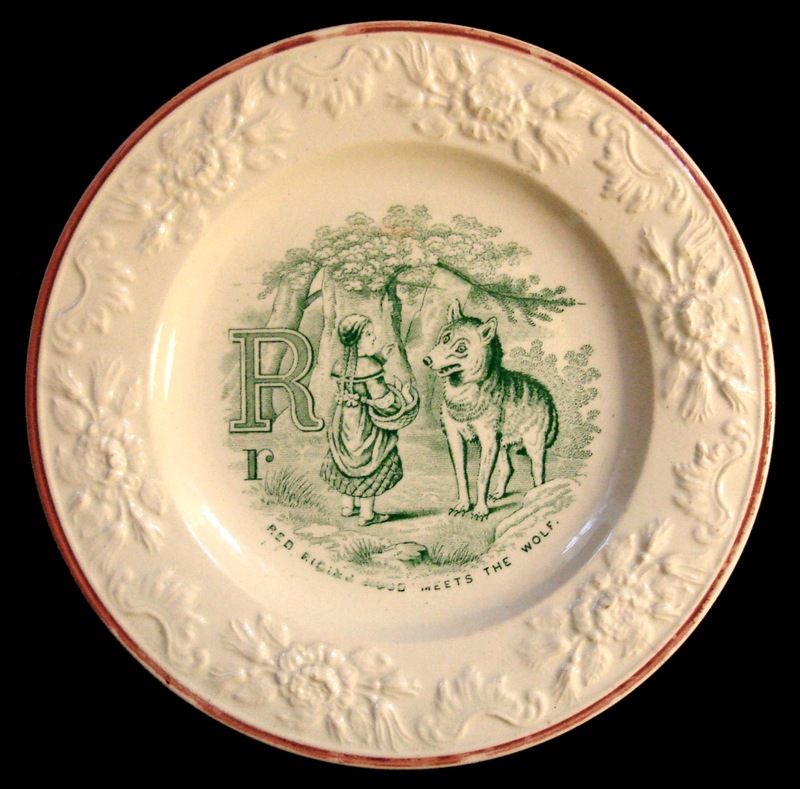 Josiah Wedgwood (1759-2005) 10 inch plate, ca, 1885/There would have been a set of six. 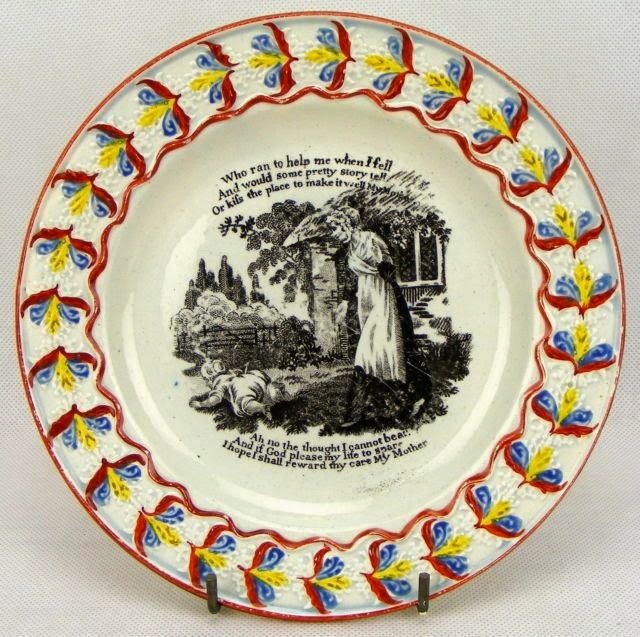 I have only shown you transferware, but there are other Red Riding Hood items like the Staffordshire figure below. 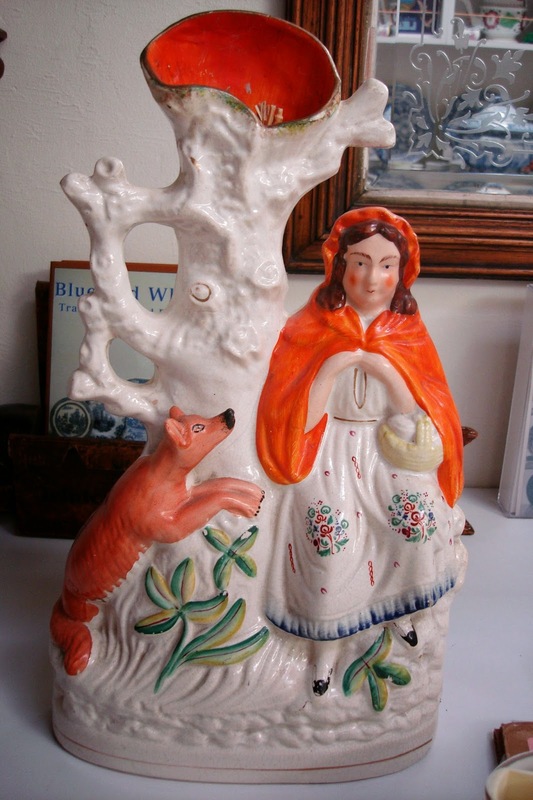 Staffordshire figure of Red Riding Hood, ca. 1860. Notice that her cape is orange! And a picture from a circa 1930s book of fairy tales. 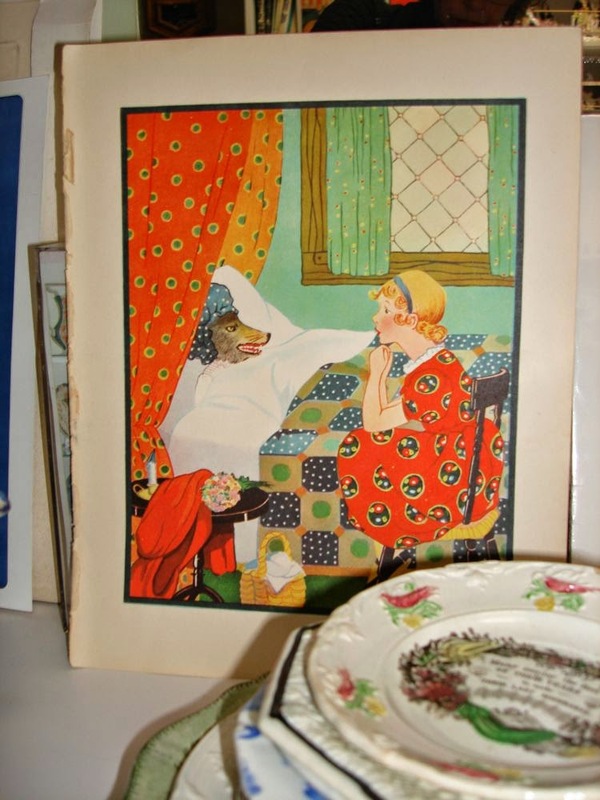 A 1930s picture of Little Red Riding Hood puzzling over her changed granny! 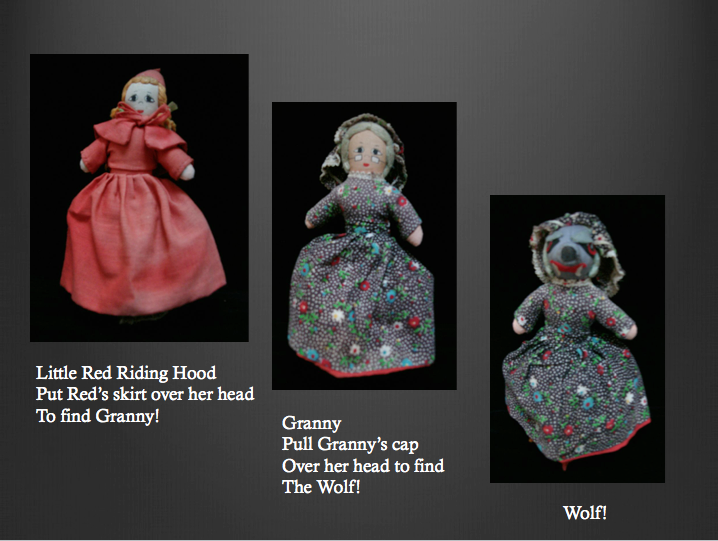 My favorite is a Red Riding Hood doll who changes into the granny by pulling the skirt over her head to expose granny's face and cap. When you turn granny's cap around, you see the face of the wolf wearing granny's cap! My theory is that we have all three beings in us; the innocent child, the dear old granny and the wicked wolf! The fairy tale is alive and well in the 21st century. 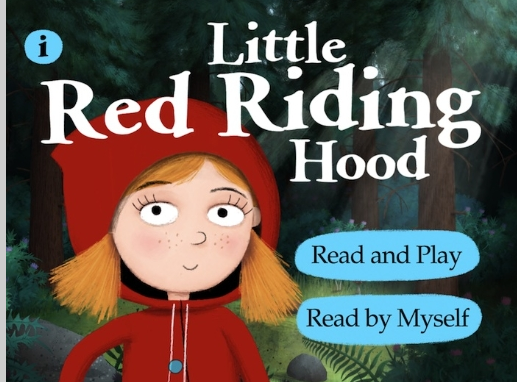 My granddaughter loves Nosy Crow's "Little Red Riding Hood" app. So do I. It is a great interactive way to teach lots of lessons and enjoy the story. 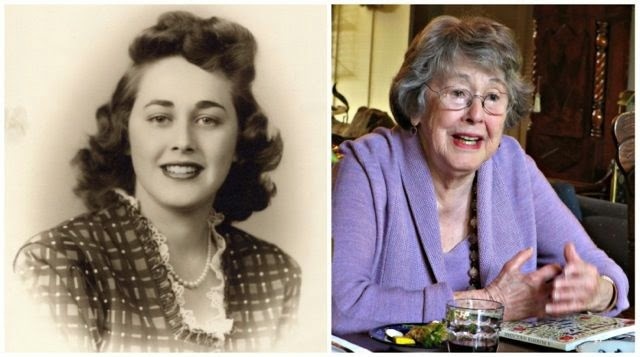 "Little Red Riding Hood" has been told in many ways for hundreds of years. 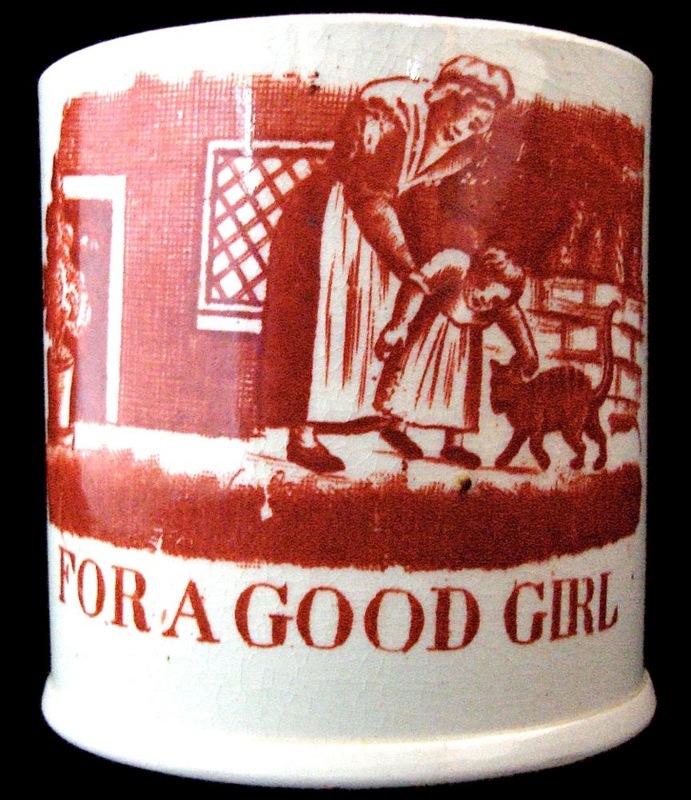 We have so many Red Riding Hood artifacts, including transferware, because the story is so loved.